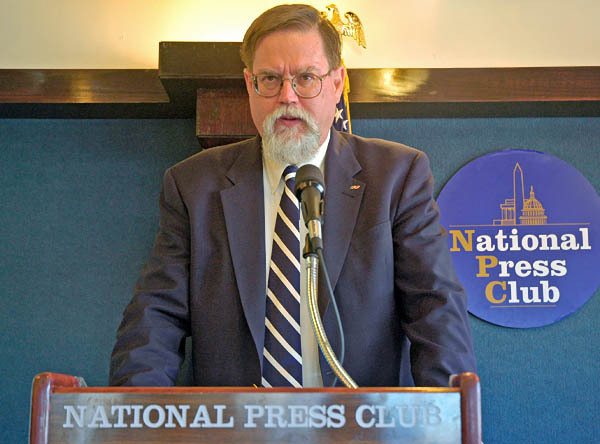 The meeting kicked off with an introduction from George Whitesides of the National Space Society, who talked briefly about the future of energy on the planet and this particular solution, space based solar power, and its enormous potential. 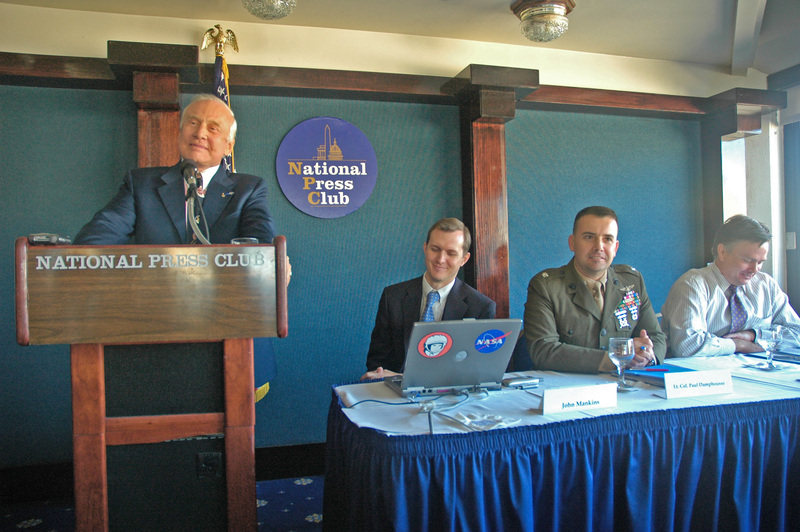 Mark Hopkins of NSS then announced the formation of the new SSAFE alliance, a group of non-profit organizations that have come together to support space-based solar power; representatives from at least four of the organizations were present (NSS, the Space Power Association, the Space Frontier Foundation, and Sharespace). Hopkins expounded on the potential of SBSP: first of all it’s the largest energy option, with far more power available than all the others combined. The sun puts out trillions of times more energy than the world now uses. Secondly, as the report finds, SBSP is potentially the greenest, most environmentally benign energy option. Even better in that regard than ground-based solar. 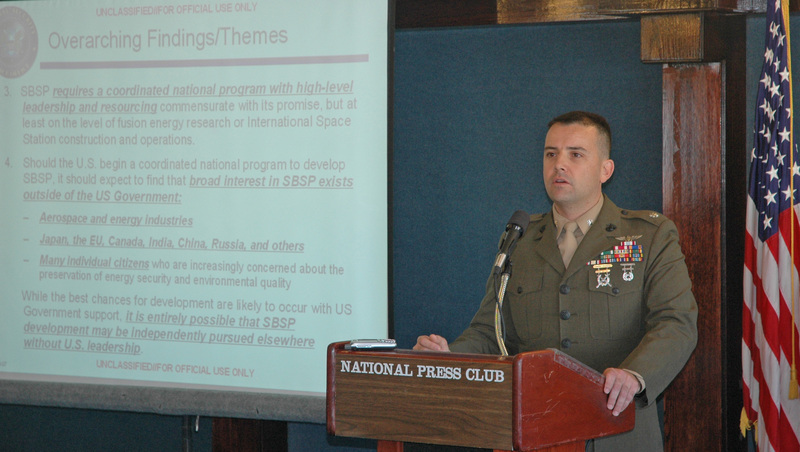 John Mankins, president of the Space Power Association, then gave a presentation on the challenges that SBSP can address. In general, energy supplies are falling behind demand, leading to increased prices. Climate change (though he waffled on this a bit) presents a huge problem in finding carbon-neutral or “green” energy sources. In the coming century we will need to find as much energy as the world uses today in green form, not just once, but 2, 3, or more times over. And in technological competitiveness, we need to do ambitious things as a nation to renew our technological strength in all areas. There is now an opportunity for near-term action: a large-scale demonstration is achievable within a decade, not 50 years away. A short video was then presented, showing a SBSP satellite system end-to-end. Video was from Kris Holland © Mafic Studios (see video and more stills). 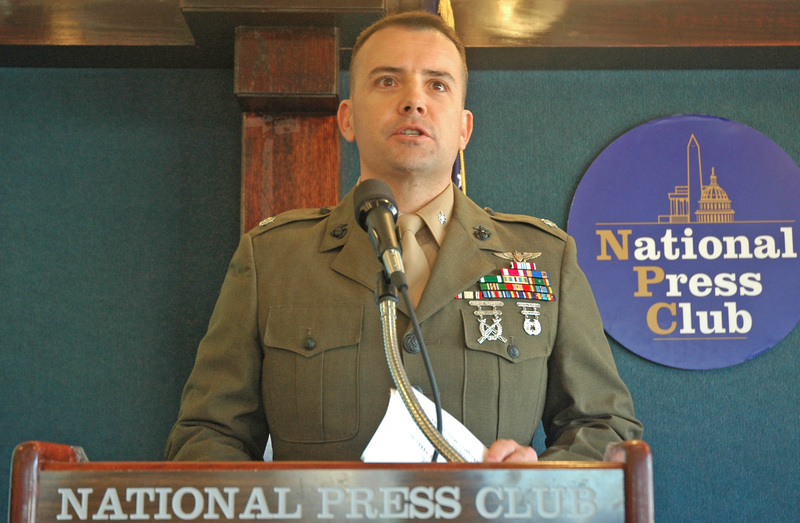 The next speaker was Lt. Col. Paul Damphousse of the United States Marine Corps and the National Security Space Office (NSSO). Col. Damphousse was standing in for Col. Coyote Smith who really led the project at NSSO; Smith had to be elsewhere today. The charter given at the start of the study was to find out “how space-based solar power can help the United States in the first half of the 21st century”. The report found it does indeed have potential to provide affordable, clean, safe, reliable, sustainable, expandable (essentially inexhaustible) energy for the people of the US, and the world. 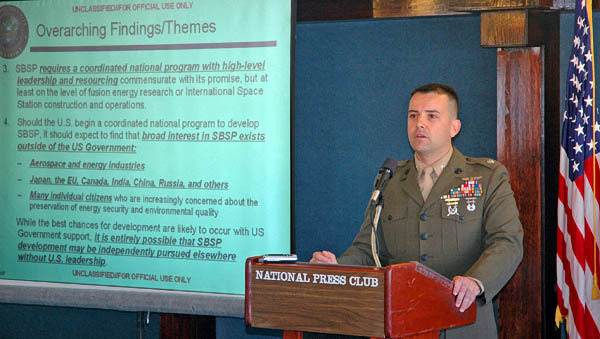 Col. Damphousse reported that the overarching conclusions were that SBSP provides a strategic opportunity for the US by potentially advancing our security, capability, and freedom of action. SBSP merits significant further study and demonstration on the part of the United States so that the commercial sector can step in. Challenges remain, and the business case does not close with present technology. The report advocates a government-led proof-of-concept program, starting in small incremental steps to a large-scale demonstrator. The next speaker was Charles Miller of the Space Frontier Foundation (SFF), who led the business case – public/private part of the study. Miller stated that the SFF believes the US government should initiate a major national project on this, at least on the level of support for fusion research. The NSSO study shows the possibility of closing the energy business case for some markets within just 10-15 years, not the 50 years people sometimes talked of. The energy market is a trillion dollar/year market (just in the US). If this takes off, the Apollo, space shuttle, and ISS will look like college science projects next to the real space age it will bring about. 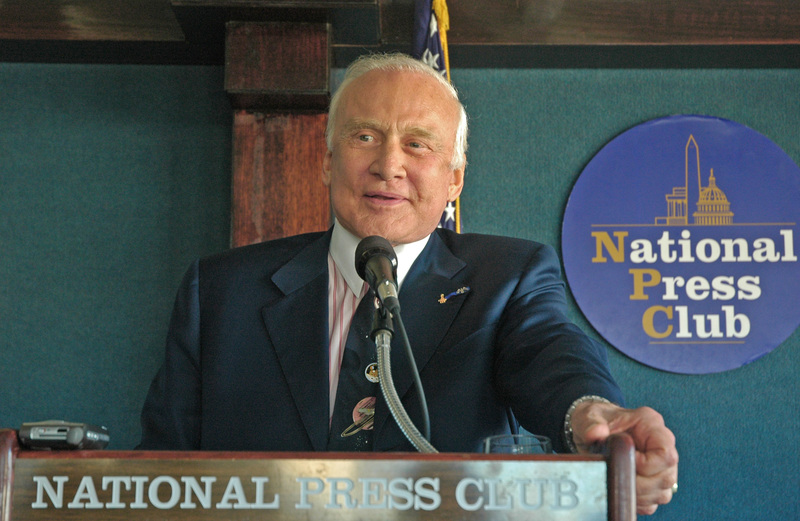 Buzz Aldrin closed out the meeting – Buzz is chair of “Sharespace” in addition to his many other achievements (such as being the second man to walk on the Moon). A little nostalgia video of the Apollo missions was his start, which he put as “what can be done with a challenge”. Aldrin has a group of engineers that has been working on reusable boosters for a long time. He’s hopeful that the need for space access for a program like this could be melded with the launch requirements in the vision for human exploration that’s going forward at NASA. The rate of launch needed to support the lunar or Mars program is not high enough to motivate reusability, but combined with this undertaking, the case is there. This is a solution that’s not just next week, next year, not just for us; this is a solution for all mankind. Just as we went to the Moon and came in peace for all, the challenge now is to look for energy for all mankind. Question [Miles O’Brien, CNN]: What’s the timeline? Lt.Col. Damphousse: We can start work on the demonstration projects I outlined immediately. It’s not a stretch to prepare equipment to put on the space station to demonstrate beaming, to test other components. Charles Miller: With government support this could take off in less than 10 years with very large amounts of power starting in about that time frame. This would bring in billions of dollars of private industry investment. 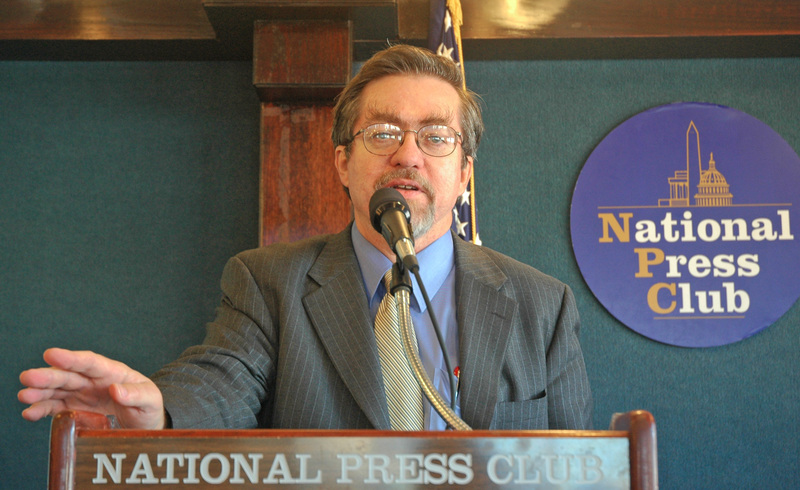 Followup question: Can private industry do it on its own, or is government needed? Charles Miller: The report goes into detail on that: there’s a need for public-private partnership. 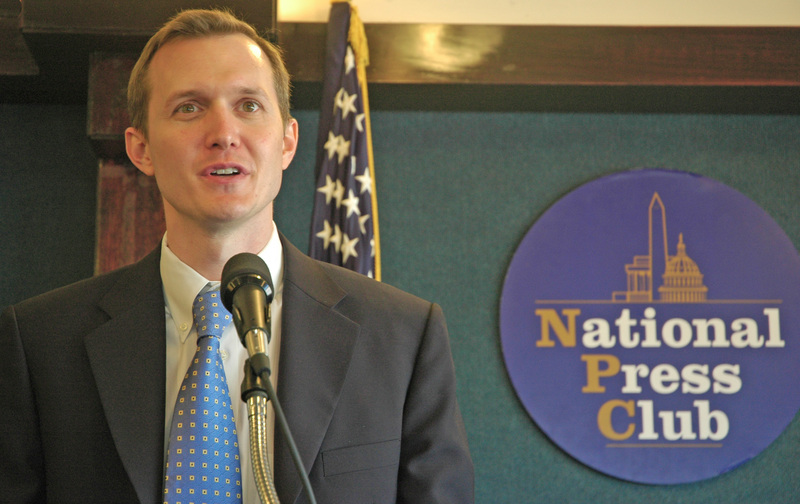 Nothing is going to happen without government because you can’t close the business case. If the government does the things we recommend: risk reduction, technology demo, etc. then the business case is there. Followup question: it cannot be done without government help? Charles Miller: That is the conclusion of the report. The business case cannot close yet without that partnership. We need government to make the reasonable steps in the report. Question [Aviation Week]: How could the space station be used to demonstrate this? John Mankins: The station is a tremendous infrastructure; “a new national laboratory” in space. It provides the capability to test a wide variety of devices and component technologies far more rapidly than you could anywhere else in space right now. We could use it to validate key concepts of operations: automated assembly, repair, maintenance; it could be a staging point for larger-scale demonstrations. Followup Question: The station is in a low orbit, how would you use it to demonstrate power beaming? Mankins: The station has about 150 kW; a few kW could be used, but it would be a low-power demo. Damphousse: At a recent workshop on ISS this is exactly what they’re looking for to put on it. Question [Space News]: You would use the solar arrays on the ISS and tie in some sort of transmitter? Followup question: Does a low-power demonstration like that really show that you can scale it up? Mankins: Some of the technology can be demonstrated that way. With some of the modular concepts you could visualize having a full module scalable once you’ve worked out the issues with a single one, and take it directly to the next step in the cycle. If it’s not so modular, there are still subsystems that can be validated that way. Followup question: What programs does NASA have now that would accept this? 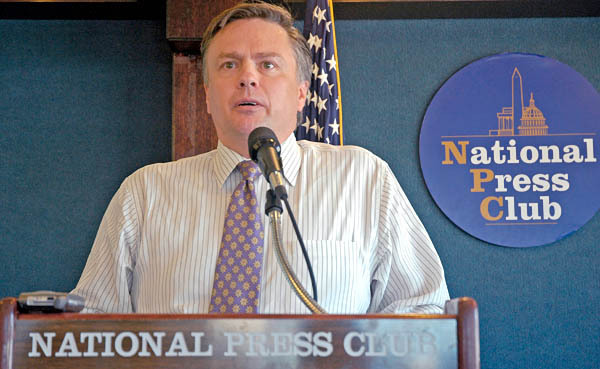 Damphousse: The National Lab workshop was collecting ideas, but he’s not sure how they’re delivering them to NASA leadership. Question [LA Times]: there is skepticism in the public about space issues given the Columbia accident etc. How will you be able to sell this to the public, and convince government this is not simply a risky space endeavor? Damphousse: The key is the demonstrators. If you can show this can work, people will rapidly believe it’s viable. A lot of supporting technologies are part of this as well. There’s the importance of some cheap way of accessing space. We’ve had a lot of starts and stops on that. A reusable launch vehicle makes this and a lot of other projects much more reasonable. That includes this project, what NASA is doing in exploration, needs within DOD, space tourism, and more. One way to convince the public that they have at least jokingly about: beam power from orbit to the White House lawn to light up the national Christmas tree. Charles Miller: Another element of building public confidence will be timely and meaningful progress. Design of the programmatic pursuit/partnership has to involve regular accomplishments making progress toward the ultimate objectives. Every year, or year and a half, there should be a new milestone reached. The modular systems notion should allow staged and aggressive progress toward the ultimate objectives. Followup question: How would you explain to the public how much energy this is, how cost effective it will be? John Mankins: You have to look at costs in terms of the markets it’s displacing. The initial markets will be early adopters with high costs. The first large-scale system will be on the scale of the Hoover Dam, enough power to light a city, but it may be directed to more than one ground location where the markets are. It will be a matter of identifying the new opportunities project by project. Question [NPR]: Why is this report recommending it be done by another agency and not by the Defense Department? Why not DARPA? Who are you expecting to read this report and take action? Damphousse: We’re looking at security in the 21st century, but we don’t see it as the military’s role to build it. There is definitely a military role as an early adopter, and to help retire some of the risk. We’d like to enable whatever agency takes the lead to then take it forward. It could be DARPA should take the lead. But the Department of Energy also has a new DARPA-like component that could take this on. Electricity from Orbit: The Case for R & D – video of 55-minute presentation made December 5, 2007, by Marty Hoffert, Professor Emeritus of Physics at New York University. Lt.Col. 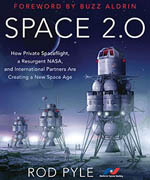 Damphousse was interviewed on The Space Show on October 19, 2007. Note that as of 12/15/2017, links to news stories that are no longer online have been removed. 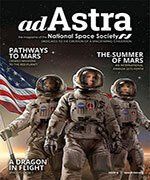 Smithsonian Air & Space Magazine: Where the Sun Does Shine: Will Space Solar Power Ever Be Practical? Associated Press: ‘Drilling Up’ Into Space for Energy (article also appeared in many other places such as National Geographic News, The Seattle Times, the Chicago Tribune, and even the Pakistan Daily Times). 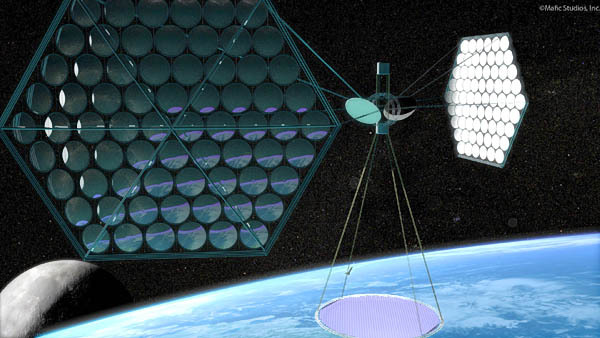 The Space Review: A renaissance for space solar power? MIT Technology Review: Power from Space? AccuWeather.com: How About Space-Based Solar Power?